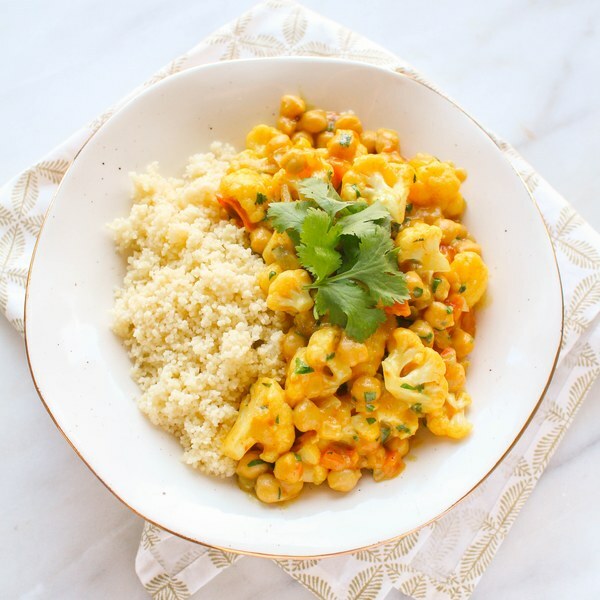 ← Cauliflower & Chickpea Coconut Curry with Couscous. Wash cauliflower and tomatoes. Cut the cauliflower into bite-sized florets. Medium dice the tomatoes. Coat bottom of pan with oil. Add onion and cook, stirring frequently, until softened, 3-4 minutes. Add garlic and curry powder to pan and stir with onion until fragrant, 15-30 seconds. Add cauliflower and chickpeas and stir until heated through, 1-2 minutes. Add tomatoes, coconut milk, salt, and pepper; bring to a boil. Reduce heat to a simmer and cover. Cook until cauliflower is tender and liquid thickens, about 10 minutes. In a small saucepan, bring broth to a boil. Remove from heat, add couscous, and stir. Cover and let stand for 10 minutes. Wash and dry cilantro. Shave the leaves off the stems; discard the stems and mince the leaves. Stir ½ into the curry (save the rest for garnishing). To serve, place couscous in a bowl, top with curry and garnish with remaining cilantro. Enjoy!